Style, comfort and position all within sight of Table Mountain. 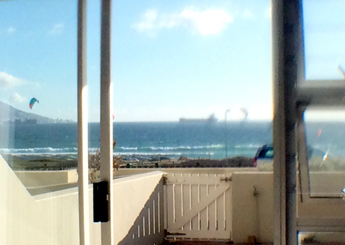 This 2 bedroom, fully fitted beachfront, self-catering, ground-floor apartment is situate along the Atlantic Coast of Blouberg and has impressive views of Table Mountain, Robben Island and Table Bay. 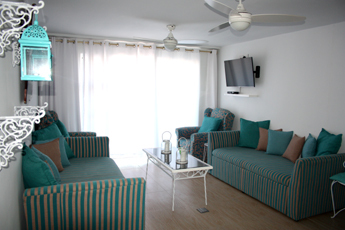 Besides offering luxurious comfort the apartment hosts free Wifi and full DSTV. 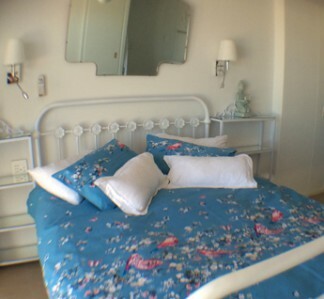 The apartment is ideally situated opposite the beach with its lengthy sandy shores. Blouberg beach of course being famous for a variety of water sports, long walks on its endless sandy stretch and whale watching during whale season from the patio or windows of the apartment. Adjacent to the beach is a scenic, comfortable and safe walkway stretching approximately 2-3 kilometres along the beachfront suitable for walking, jogging, pram-pushing, skating and cycling. This is one of Cape Town’s best beaches for kite-surfing, surfing and windsurfing. All major tourist attractions are within easy and convenient reach whether you have your own car or need to rely on My Citi bus or a taxi/shuttle service. 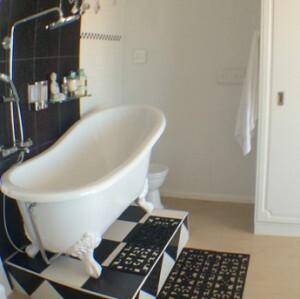 Main Bedroom – sleeps two guests in comfortable double bed, en suite shower bathroom, bath and bidet in bedroom, from the bed stunning views of Table Mountain, Table Bay and sea. Relax lay back in the bath and watch kite-surfers skimming by. 2nd bedroom – two sets of double bunks (sleeps 4) each bed with own reading lamp. Bedrooms are comfortably kitted out with good quality linen and towels; both with individual en suite bathrooms that are exceptionally well fitted with shower, hand basin and toilet. Lounge/dining area – 2 comfortable armchairs; 2 large comfortable loungers; DSTV PVR and dining seating for 6 – 8 persons. 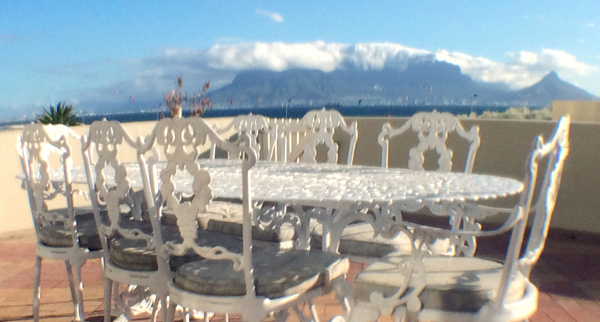 Leading off the lounge and main bedroom is a large patio overlooking the sea towards Table Mountain and Robben Island ideal for entertainment or relaxation, sit back and soak up the beauty of Cape Town – sun, sand and sea. 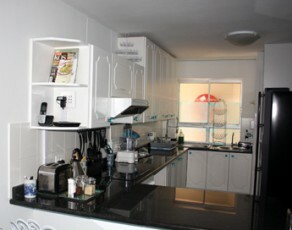 The apartment is fully equipped for self-catering with quality electronic equipment, microwave, induction hob with electrical oven, refrigerator with ice and cold water dispensers, wet waste disposal system etc. ·	Farm stalls and other Cape West Coast attractions. ·	Secure communal heated swimming pool and braai area. 6. Check in 14.00 (2.00pm) unless otherwise specifically arranged. Book any 2 for 10% discount! Yearly Birding and Pensioners' Special! Earth Trekkers Senyati Safari Camp selected as one of top ten accommodations from around the World. Thailand of Senyati? Luister wat sê Bok Radio en geniet!